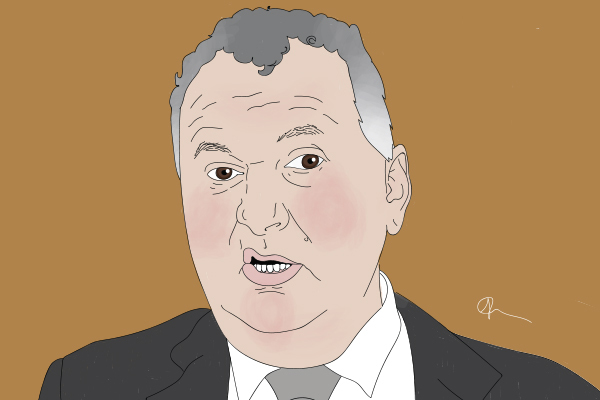 The self-described ‘First Citizen of the Provinces’ and Minister of Regional Economic Development Shane Jones has a message for Fonterra’s Chairman John Wilson – it’s time to resign. “The leadership of Fonterra, I believe, starting with the Chairman is full of their own importance and has become disconnected,” Jones told reporters on his way out of the House on Wednesday. “The Chief Executive has gone – well that’s only one party of the double Dutch that we’ve had to put up with in Fonterra over the last nine years. Former Chief Executive Theo Spierings resigned in March but is not due to leave till some unspecified time later this year. Jones is not happy with the dairy giant’s activity overseas and the money it lost in foreign ventures. In March, Fonterra wrote down the value of Beingmate from $405 million to $244 million. In January, the Chinese company downgraded its 2017 earnings to a loss of $171-$241 million. The company has been struggling for much of the period since Fonterra bought a $750 million stake in 2015. “I’m worried about the absolute absence of accountability for the enormous amounts of dough that the current Fonterra chairman has presided over,” Jones says. He adds that Fonterra should focus less on interfering in politics and more on justifying the money it lost overseas. Calling for public sector chief executives and chairmen and woman to resign has become somewhat of a regular occurrence for Jones. After Air New Zealand canned some of its flights to regional parts of the country, he called on its chairman, Tony Carter, to fall on his sword. After news broke that a Warehouse branch in Kaikohe closing, the NZ First MP blasted the company’s Chairwoman, Joan Withers. Both times he has been less than apologetic about his comments. Jones, however, hasn't been the first person to suggest that Wilson's time at Fonterra should be called. National’s Regional Economic Development Spokesman Paul Goldsmith says the Prime Minister needs to step in to stop Jones from attacking business leaders. “Shane Jones’ attacks on Fonterra’s leadership are the latest burp from a man who is fast losing any respect he once had,” Goldsmith says. Shane is right, but let's not pretend he is a hero here. Yan - also known as Bill Liu, Yang Liu and Yong Ming Yan - admitted receiving "significant sums of money"
between 2012 and 2014 from a series of frauds. The surprise money laundering conviction led to the Department of Internal Affairs to investigate whether his New Zealand citizenship should be revoked. If Shane Jones really has our interests at heart he'd be calling for himself to resign. Clearly Jones didn't make much money off that deal because he was a bit tight fisted at that one hotel. Said the man who looked on and said nothing about shutting down Taranaki's highest skilled and highest paying industry. Has the oil and gas industry shut down? Missed that in the news, but talking to my mate in the industry the permits they have are huge and expire in 99 years or so but never stop a good story. For a better dairy industry, a change in DIRA would be more effective than firing some vision-less-sit-warmer figureheads. Shane Jones is a cobbler from the north. A bit like his mate really. He makes politics fun and that's about the only plus side we see from any of our politicians and their politics these days. He's almost as good as Shane Warnie was to the Aussies. sold my shares in Air NZ last month after Shane Jones mouth ran away. Share price continues to fall. This will do nothing to help Fonterra's share price that has been in free fall since the CoL took office. He needs to keep his trap shut, and engage his brain. This sort of rant damages NZ reputation massively on the international stage. Not to mention the loss of value to Investors, and farmers who have their livelihoods at stake. Fair to say Jones rant and the coalition in general has absolutely zero to do with Fonterras share movements in the last year. Fonterras problems are well documented. It’s also undergoing a review. Jones’ comments are not helpful, are timed badly. Let those with a stake in the business call the shots. Jones' key point, it seems to me, is this "that Fonterra should focus less on interfering in politics...". And in this he's absolutely right. Fonterra has been used to treating Wellington like a company town. From the sacking of an elected environmental council and replacement with pro-dairying flunkeys, through influence in the deployment of public money in massive irrigation subsidies, to the distortion of New Zealand's foreign relations in support of their Chinese fantasies, Fonterra and its industry have had, and have come to expect, unquestioned and privileged political influence. Perhaps it's time for the company to focus on developing its business acumen rather than relying on special treatment in Wellington. In spite of all its political meddling and special pleading it has still managed to lose market share in China to more professional competitors. Oil/gas - who's next on the Industries We Hate list? Industrial Relations - who will be the Lucky Sectors selected out of the Lotto draw for Union Workover? Dairy - already a target for the Greens, and now Mr Slush Fund hisself - the inimitable Mr Jones...yet earns a major slice of our exports. Highly visible CEO's - oh, there goes Mr Jones running his Mouf, again - Air New Zealand, Warehouse, Fonterra. Who's next and for what Treatment? Oil/Gas - I didn't see companies lining up to use their exploration rights when oil/gas was over $100 per barrel - I don't see it now. Industrial relations - more like slave labor these days. Dairy - let farmers clean up their own mess then. Highly visible CEO,s - agreed, but they are often highly useless. Low 'business confidence' - I wouldn't be confident either if I never invested in training staff and refused to move with the times. Cannot see any reason why this CoLs should last more than this term at all ... this view is getting more popular every time the RH SJ and others like him open there trap ... Yes to the winner goes the booty for a while, then the boots come back to kick the losers out smart fast ! ... Alas, all after costing us a lot of money !! Well done NZF voters !! you should be ashamed for allowing this to happen. Hope you have learned your lesson. And we old timers all know just how painful a kick in the booty can be! Nar, National are incompetent, look at their MP's and the state NZ is in. Doubt you'll see your beloved National back in power anytime soon. Actually Eco Bird, that would just be the H SJ - Winston Peters is the only remaining Right Honourable in Parliament today. Normally WP & NZF hibernate for just over two thirds of each parliamentary term and the they go hammer & tongs and flail at what ever issues can lift their profile pre election. And it has generally worked, more or less if you are prepared to overlook the Owen Glenn publicity debacle. Maybe Shane knows Winston will not be there in the frontline, not there at all in fact, in 2021. Therefore, maybe the profile raising and line dancing has had to start two years earlier than usual? Indeed, absolutely disgusting, imagine making promises to regions to garner votes, how are those 10 Northland bridges going by the way? This the quality of politician we have in this country. He is utterly incompetent. Yep, all second rate. The best brains don't go into politics. Agreed totally, but you would have to be having a really happy and optimistic day, to call them second rate. Ask yourself or anybody else for that matter, how many of them going back as far as you wish, would you like to work for, work with or have work for you? It is so easy to criticise but I wonder if ANY of you could do any better. What any better than The Honourable Brownlee at solitaire? Glad to say you are right. The boy done good. Just another day at the office for a top man.